Aesthetic Blasphemy: Hey clocks, won't you run on your legs when I set you on fire? Hey clocks, won't you run on your legs when I set you on fire? 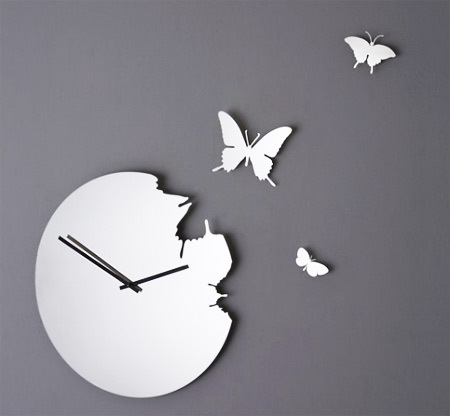 Only if some night, I destroyed all the clocks of the world that maintained good time. Only if someday, everyone woke up to the chirruping of the birds or the gleam of the sun than to the annoying alarms. Clocks have been grossly misunderstood and utterly misused, ever since the idea of keeping time sprouted in someone’s mind. He/She must have been under a seriously funny spell, and then like any other poor joke, this too was shared and spread. ‘Keeping Time’? What is that supposed to mean? 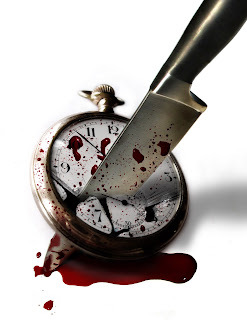 Time is supposed to flow; it is an entity in the space-time continuum, why would anyone even want to ‘keep it’? Time is supposed to keep us, it’s a one way street, and any entity trying to be on the reverse route is enroute to oblivion. Yet we tend to run on this conveyor belt in the opposite direction, seldom making progress, only to be prematurely being overcome and overwhelmed by its speed. Like dry sand through hands, time slips away. Time, it is meant to be aware of something that is passing away, gushing by, like a rivulet. And yet, the gauge that was meant for mere gauging has been bred into an unforgiving master, whipping us, skinning us and we like slaves crawl on bleeding knees, in quagmires of time. The concept of ‘late’, though well established now, should not have been there in the first place. And now, we are too busy trying to avoid the repercussions of being late. Why do we want ourselves to be bound by the idiosyncrasies of time-keeping, routines that grow more mundane, the more rigorously and religiously we follow them? I too am bound by these like many, only that I’d love to curve out and do something that I’d love to when I’d want to. (Though it is true that most of the time I want to do a thing that I don’t quite know how to do, nothing.) Other times, like days as today when a beautiful person (just because he/she can talk my subject with awe and spellbinding enthusiasm and glee, I’d call the person beautiful. They are like gardeners watering my zeal), I realize that I can never hate the subjects I chose to pursue and would want to give all my time to read them no matter how poorly I had done in past examinations, and yet I merely sigh, I am too engrossed, I have no time. Need to manage more time. And then I wonder, how can I do this to something I have come to love, there is time, and always will be, for everything my mind can crave for and desire for. I believe, time is meant for historians. To maintain a chronicled list of events, that is all. For us, time should only be to flow with, in continuum. And as far as keeping time and punctuality are concerned, with the exception of commitments already made, I’d love to forget the watch. i think not waking up to an alarm clock is d best thing one cud ask for. dats y sundays r so special. Time can be merciless and we all know it. yes, time can be merciless, but then if it wasn't, we would not have all the fun. worst is how it never turns back...! Thank You for the award. I appreciate that, truly. I have Boondock Saints as my ringtone, and I don't mind it. But yes, smiling when getting up is more important which comes without any alarm. Time is memoryless. It's us who don't let go. Clocks are meant for geologists too? Strange. Why do you need to confine yourself to time restrictions while digging black gold? I totally agree and appreciate this work of yours...time should flow.. I wish we all could let the time flow rather den binding and holding it! You've written about something so close to everyone's heart, so beautifully. Really! Time and its irrevocable enmity and friendship. It can heal merciless wounds, can also create rifts that one never knew existed. Loved the picture and the words to go with it! Time is immortal and we the mortals. Time is never enough...like money, like beauty, like fame...the more we get to do what we like, the more we crave for doing it more...a vicious circle like every thing else kept on our path to trap us. Time should be kept otherwise we'd lose it irreversibly, na? We've actually become slaves of time,rather clocks I must say. We're trying so hard to run faster than time that we've forgotten what it is like to flow with time in a rhythm. I hate this entire idea of being on time, exam time, office time, blah blah. It kinda takes the joy out of living. Its an interesting concept...Clock was designed to assist us, help us..and now..actually we mold and design our lives around it...short term plans, long term plans...ye..wo...we live everywhere....but in the present. Time is an illusion...and nowadays its moving damn fast..
And what after the morning is past? Back to our beloved time clock? Wow!!! This is such a different thought..! Gosh, now why did I not think of this ever...!! This post of yours has made my mind swirl....! No watch, no time no restrictions!! super interesting as always! I would love to wake up to chirping birds and the morning sunshine too, rather than my incessant alarm! "There is time"...such comforting lines! Our lives have become compartmentalised. Very true.. I liked the way u expressed the thoughts in here.. just like raw thoughts as it comes to our mind..
and the "I have no time. Need to manage more time" is I guess a universal disease from which everyone is suffering. and i reallyyy wish i could live in 'timelessness' if only it be for a lil while. If only everyone expressed their desire to live a life which is not constrained by 'time', but, of course, everyone waits for the other to bite the bullet. Time is here to stay, unfortunately. By the way, has anyone told you that your pictures are mostly surreal? yes, i hate alarm clocks too, bit they are essential evils ..heheheheh! I wouldn't want to love time. There are many other things to love. Ambition is contagious. Perhaps he should practice more. Philosophical rants on a different timescale!!! the habit of looking at my watch. Well it may be awkward that 99.9% of times i never get annoyed by my alarm clock. All because i love to get up early in the morning and clock is something which helps me to do that. Its never the clock which displease people in waking up early its only their laziness and then later even the chirping of birds will be equally annoying if we replace it with clock. ""I realize that I can never hate the subjects I chose to pursue and would want to give all my time to read them no matter how poorly I had done in past examinations""
If only it were as easy to attach to less importance to time in reality. Moments consists of time that fluctuates and make differences! True, and yet, its a device of our own making. very well written. time is what everyone needs to manage. so if I broke the clock as u hav suggested thn I hav to buy tht damn clock every day. There is not one time, not one single time when I have felt better for looking at clocks. Not in the exam hall, not in the morning, not when I have to meet someone, not during an interview... not ANY time. If only we could wake up to the sounds of the birds chirping and to the sunlight falling on our faces :) But in a crowding city, apart from alarms, all that can wake us up is the sounds of the traffic! A lovely post. Very thoughtful. Time flies, and one must take it in a beautiful way! We must go with it's flow! Well said, time is supposed to keep us and time is what is mastering us. Historians? Every being is creating a history I believe. As always brilliant post ! I believed no time ever wasted for time that is being enjoyed! Time. I always keep cribbing about it. We're so dependent on it, yet we despise it so much. :) How funny right? Loved how you took this and made it so beautiful. Oh I know how Cesium clocks work, lets make a clock that gives wrong time. we do try to control life dont we building watches , calendares , predicting weather etc but do we really control anything ..
who made these clocks ? I have some different relationship with them which I can't even express. sometimes I wear watches because they look good even when they DONT work. I guess I am one of the last ones to comment. But it is okay, given that my namesake was the first one to comment. Amazing piece, beautifully written. I am in love with the way you write, and would want to comment on each of your post. Since I don't, I would at least want you to assume that I read each one. Kudos! as you have aptly put out! Time! so much to say about it. Well its actually true in saying that the clock is ruling our life...I just cant see my wrist without watch. :P That is good, so if someone asked you time, what do you do? You were chased by time? Interesting. Someone too important you seem to me. Wow..beautiful words..wish I could write like you..
How about waking up before the alarm and grinning at it when it rings.Btw ,i loved your thought on 'beautiful people'.